Provisional BoST Meeting - See full list of BoST meetings here. How is going to document? New people here? Quick introduction round. Short update by @Lars2i about the development of the statutes and founding process of the organisation. Lars was working on the new webpage. It is not finished yet but progressed. Let’s have a look at it and collect feedback. ##5. Call for Cities Announcement Date and Strategy? When will we announce the new OSCEdays, send out the call for cities? And what is our strategy to spread? Query if we need to do this but seen as a good way for clarity through excel combined with a fromy topic by Lars to make more visible. Sam also thinks this will be good to show the visibility of time spent to do this, reach out to people and organisations (like Lars did it for almost a week last year). Tim also suggests we can look at a Thundeclap campaign. Could look at doing early Feb with newsletter to raise awareness and call for cities. He’ll look at time, effort to do this. 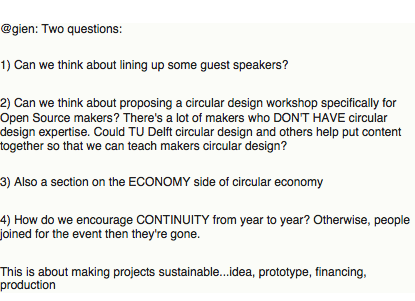 ASIDE - LArs mentions also ouishare conference where can talk and Erica also Upcoming EU Circular Eocnomy policy discussion in Feb.
Ideas/ suggestion for a more international mini example from last year - Perhaps Chennai? Discussion over sponsor levels - Erica suggests media could be higher, get quite a lot, Although Silvia suggests how not to alienate smaller startups (however also need to recognise diff from local and global sponsorship).